On Saturday, President Obama heads to high-class Martha's Vineyard for an eight-day respite with his family. Judging by his past few summer vacations to the Massachusetts vacation spot (2009, 2010 and 2011 - he skipped last year to campaign), he'll likely go on a family bike ride, play multiple rounds of golf and stop at Bunch of Grapes bookstore for summer reads. But already, the trip isn't stress-free. Martha's Vineyard residents are upset about potential road closures and questions abound about the cost and optics of a president going on vacation. Although they have hosted the president three times before, some Vineyard residents are not happy about the trip this time around. The Vineyard Gazette reports potential road closures that Chilmark Selectman Warren Doty called "very disruptive" and The Martha's Vineyard Times has warned residents to expect "extraordinary and lengthy up-Island detours" throughout the eight days. In the past, the Obamas stayed at Blue Heron Farm, an estate tucked off of main roadways, but the property was sold in December 2011, forcing them to find a new rental - one that seems to require more security. When asked about security measures and costs of a president traveling on vacation, the White House maintained that some things just come with the job. "Obviously, when you're President of the United States, you carry a little baggage when you travel. And that's true whether it's on a summit, international meeting, a domestic trip, or for a vacation," Jay Carney said. As for the time the president is spending away, the White House contends that while Mr. Obama looks forward to having a few days with his family, he is never fully on vacation. "Wherever he is, he's President of the United States and will be dedicating a portion of his day to being briefed and working on all the issues that are on the table in front of him," said Carney. Past getaways have proved that to be true - last time he went to Martha's Vineyard, he was consistently monitoring developments in Libya's civil war and each of Mr. Obama's four Christmas trips to Hawaii have been somehow delayed or rescheduled around year-end Congressional votes or crises (the fiscal cliff, the payroll tax extension, START Treaty negotiation, "Don't Ask, Don't Tell" repeal and the Affordable Care Act). CBS News White House Correspondent Mark Knoller, who keeps comprehensive records of Mr. Obama's vacation days, finds that the president, taken much less time off than his predecessor. 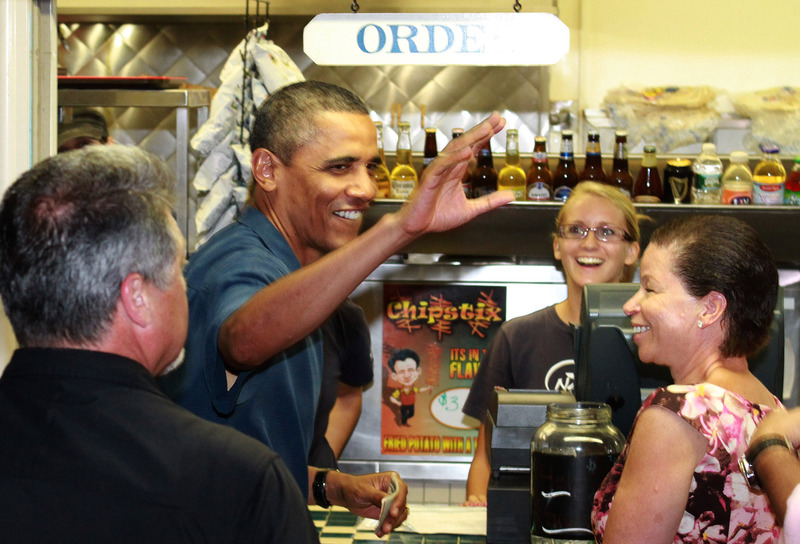 Mr. Obama has been on 14 vacations since taking office, spanning all or part of 92 days. At this same point in his presidency, George W. Bush, had made 50 visits to his Texas ranch, totaling all or parts of 323 days. In addition, at this point in his presidency, Bush had made seven visits to his parents home in Kennebunkport, Maine, spending all or part of 26 days there.